Center Parcs unveils a new TV advertisement as part of a broader marketing campaign celebrating family time. The new 60-second TV commercial was launched 23 December, during Coronation Street on ITV. The campaign, which includes digital and VoD activity, is timed around the travel industry’s peak booking season as families start to plan their family breaks, and will run until March 2016. The film features a family of bears representing what human family life is like today: distractions, work challenges, concerns about quality time with their children. In one scene, Mama Bear is stuck working late whilst Papa Bear is making dinner for the family and cubs are in other rooms of the house. The next day is a fresh start, as the family head out for a Center Parcs break. As they approach the forest, the stresses of modern life fall away: they immediately connect with the natural environment, the feeling of freedom and getting back to what is important – being together. The soundtrack, sung by Ben Madeley, is a beautiful rendition of “True Colours” which was first made famous in 1986 by Cyndi Lauper. “We want to inspire people to carve out more valuable family time together not just during the Christmas period but in daily life too whether it’s a picnic in the park, family dinner time, bedtime stories together or a short break at Center Parcs of course!” Colin concluded. The new advert, “Bears”,differentiates itself from other short break destinations, in an idea conceived and created by creative agency Brothers and Sisters. Ben Liam Jones directed the advert through Mustard, with Electric Theatre Collective responsible for CGI animation. Media planning and buying is through Blue 449. Make it Rain handled online search, social content and engagement. The whole commercial took four months from concept to completion, including the animation which took 25 animators 10,450 hours over three months. 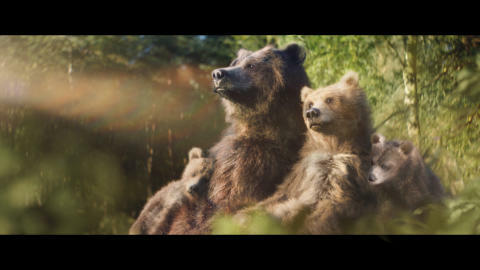 Studying footage of live bears to reference and capture their qualities in the advertisement, together with filming professional actors gave the director and production team the detail needed to create the animated ‘bears’ in photo-real CGI animation, when the bears were in ‘human’ scenarios such as the office and commute. Krystian Godlewski, who plays the Mama bear character, is known for his film role as Groot in Guardians of the Galaxy; and Dan Phillips who plays the Papa bear character, appeared in TV dramas Between the Lines and Stella. Four child actors and one adult stand-in were used for the girl and boy bear characters. The forest elements of the advert were filmed at Center Parcs Sherwood Forest. 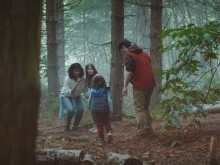 Center Parcs unveils new TV advert celebrating the forest as an immersive playground.